On the whole, Apple's June quarter was a huge success. The company posted record revenue for the quarter and delivered earnings per share that blew analyst expectations out of the water. Quarterly iPad sales, however, were somewhat disappointing. Apple during the June quarter sold 13.3 million units, a 9.2% drop from the same quarter a year-ago and well below analyst expectations of 14.16 million units. What's more, iPad sales growth has been stagnant two straight quarters now. So what gives? What lies behind these slumping iPad sales? Is the tablet era over, perhaps just a short lived fad à la netbook as some have been quick to suggest? While sweeping statements pointing to the demise of the tablet are, I think, far too premature, there's no denying that the stats don't lie; iPad sales are in fact down. Just this week, Best Buy CEO Hubert Joly (what a name, by the way) told Re/Code that tablet sales are "crashing." As with anything, context is important. The iPad effectively ushered in an entirely new product category. Though many companies, and Microsoft in particular, had been championing tablets for quite some time, the tablet market never quite took off until Apple entered the fray. The resulting problem with iPad sales estimates is that they rest on frameworks that were originally crafted to examine completely different products categories. The iPad has different use cases than smartphones and traditional PCs. It has its own pricing structure and naturally carries with it a different refresh cycle. Though the iPad is essentially a cross between a modern day smartphone and a PC, people seem to expect iPad sales growth to more closely mirror the iPhone than the Mac. And by and large this has proven to be the case amidst modest Mac growth over the past few years. But with the tablet market maturing, perhaps a recalibration is in order. Not so fast. The truth is that the iPad was never cut out to replace the PC, so we shouldn't be surprised that it hasn't. And, just as the "death of the PC" narrative has been oversold, it's way too early to write off the tablet's future. It's simply time to adjust expectations. The iPad's sales woes don't mean it's a bad product. Apple customers consistently report satisfaction with their tablets, and the iPad continues to command a dominant share of the market in the face of intensifying competition from Samsung, Microsoft, Amazon, and others. But there are inherent limitations to the device's ubiquity. As great as it is for watching movies on an airplane or checking email over breakfast, it still can't match the power and versatility of a desktop or laptop as a primary workstation. Spot on. iPad sales exploded quickly, but now that the tablet market has matured, it seems that we're at a point where iPad refresh cycles more closely mirror PCs than they do smartphones. Below are a few theories as to why. Every two years -- and in many cases, every year -- people upgrade their iPhone to the latest and greatest model. Over the years, Apple has skillfully been able to provide enough of an improvement with each successive iPhone model to convince users to upgrade. From the Retina Display introduced on the iPhone 4 to the larger screen and LTE support on the iPhone 5 to Touch ID on the iPhone 5s, Apple each and every year provides enhancements that get consumers into stores and willing to plop down $199, yet again, for a new iPhone. In stark contrast, the impetus to upgrade to a new iPad model is far weaker. Ever since Apple introduced the third-gen iPad (which featured a Retina Display), iPad enhancements have been understated; faster performance, solidified battery life, thinner and lighter form factor. These are all great additions and certainly work to make Apple's current iPad Air an incredible machine, but alone, they don't exactly get the masses excited to upgrade. Underlying this dynamic may be the fact that speed enhancements and other incremental improvements are much more impactful on truly mobile devices like smartphones than they are on tablets. A better camera on the iPhone 5s? Awesome. A better camera on the iPad? That's nice, but not much of a selling point given that most people prefer taking photos with their smartphone. What about faster web performance? Again, that's great for a truly mobile product like the iPhone, but not as impactful for a device like the iPad which is more prone to being used on a Wi-Fi network. Even iOS improvements tend to have more of a fundamental impact on iPhone usage habits than they do on iPad usage habits. That said, perhaps the issue isn't waning iPad interest, but rather the simple fact that consumers are less inclined to upgrade to a newer iPad model as they are with an iPhone. It's also important to remember that the iPad is more expensive than than the iPhone. iPhones are subsidized, iPads are not. You can pick up an iPhone 5s at Walmart, for example, for just $99 today. The base level iPad Air, meanwhile, will set you back $500 while the base level iPad mini sells for $399. Products with more expensive pricetags are always on slower refresh cycles than cheaper ones. Another commonly-voiced explanation is that tablets by their very nature are limited devices. Sure, we know that the iPad can be used for content creation in all sorts of interesting and fascinating ways, but the fact remains that they're not as portable as smartphones nor as powerful as dedicated notebooks. To that end, one can reasonably argue that tablets by and large are "And 1" purchases, which is to say that they're bought by people who already have a smartphone and a computer but decide to get a tablet as well. Everyone needs a phone. Not everyone needs a tablet. The most recent data suggests that tablet penetration in the U.S. is now at about 45%. 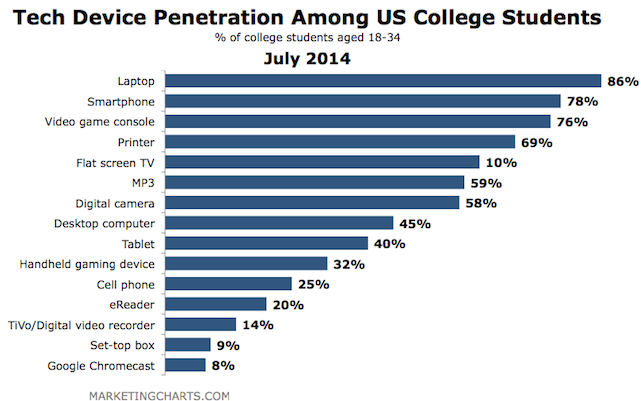 And for college students, we see that tablet penetration still lags behind video game consoles, printers, smartphones, laptops, and even digital cameras. In short, consumers don't need a tablet in the same way they need a traditional PC and a smartphone. The iPad's strength has never been its ability to completely supplant the PC in all computing environments, but rather as a new product category capable of fusing the power of a desktop with the mobility of a smartphone. To that end, the iPad's very strength is also its weakness, which is to say that it's not as powerful as a PC nor is it as portable as an iPhone. Are larger screened smartphones having an impact on iPad sales? One of the more commonly proffered arguments behind slumping iPad sales is the proliferation of larger phones. After all, why shell out cash for a tablet when you can pick up a larger screened Android tablet. Why would you buy a phone with a 5.5-inch screen and a tablet with a 7-inch screen? You can certainly make a case for Apple's larger iPad Air, which I own and thoroughly enjoy, but the numbers don't lie: all the action's in the phone market. It's an interesting idea, but one that ultimately ignores a number of important factors. First, Apple's larger screened iPhones at this point are no more than rumors, and their impending release doesn't do much to explain why consumers in the June quarter bought fewer iPads than they did last quarter. Second, and more importantly, larger screened smartphones aren't all that new. If anything, one of the key selling points for Android handsets for years has been their larger displays. In other words, I think attributing slumping iPad sales to larger smartphones ignores many of the peculiarities of the tablet market. The iPad may very well be taking us into a post PC era, but it's important to remember that the device is its own product category with its own peculiarities. The tablet era is relatively new and, consequently, many of the predictions and assumptions surrounding the iPad were simply nothing more than guess work. It's important not to attribute too much weight to any one quarter because one tends to lose focus of the long term. While one could point to the recent quarter as proof that the iPad is doomed, one could just as quickly point to Apple's recent holiday quarter when the company sold a record number of iPads -- 26 million units to be exact. In fact, iPad sales during Apple's most recent holiday quarter were up 13.5% year over year. Notably, Tim Cook addressed slumping iPad sales during Apple's earnings conference call, explaining that "this isn't something that worries us." He also said that there's more innovation Apple can provide in the tablet space. Looking ahead, it's far too soon to make any grand proclamations about the vibrancy of the iPad in one direction or the other. One quarter in and of itself should especially not be used to gauge how the iPad will perform going forward. The real test, I think, will be how Apple's iPad sales fare during this year's holiday quarter.